The Hijacked Hearse: Dispatches From The Ebola Outbreak In DRC : Goats and Soda Almost every day, the Democratic Republic of the Congo issues regular reports on the Ebola situation, There are facts, figures — and today, a harrowing tale. 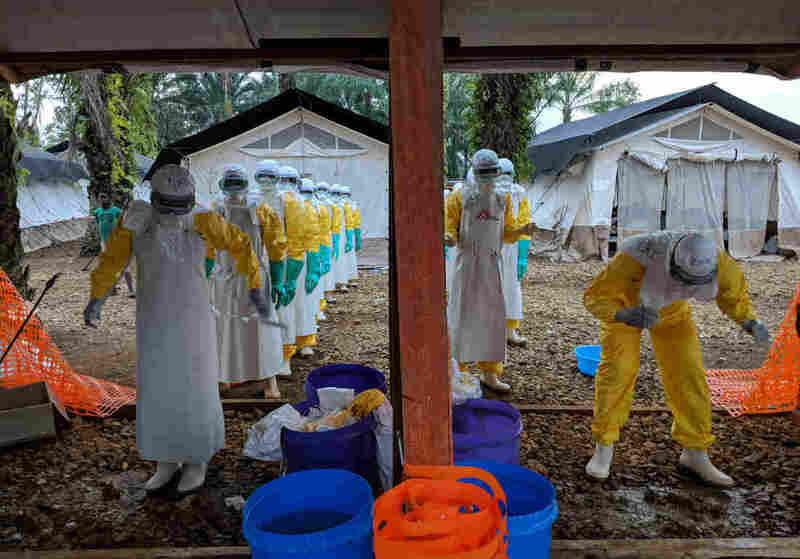 Health workers remove their protective suits at a treatment center set up by Doctors without Borders in Mangina, a town in the Democratic Republic of the Congo. But for all the dry language in these dispatches, every so often they offer a vivid glimpse of a tumultuous, high stakes drama that is playing out almost daily as health workers and safe burial teams seek to win over communities who are deeply mistrustful of their intentions. The accounts speak of tense negotiations with village leaders and of patients who refuse treatment and flee — only to be found days later, on the brink of death, in a city several hours away. Then came Friday's release, which included a story so compelling that we've translated it here from the original French (and lightly edited it for clarity). On Wednesday, October 10, 2018, members of the community stole the body of a woman who died at the Beni Ebola Treatment Center on her way to the cemetery. When the woman died, the family asked the response team to make some concessions regarding the burial ceremony of the deceased. In particular, they requested that the hearse be driven by one of their acquaintances and that five family members be given personal protective equipment so that they could be the ones to carry the casket. This request was accepted by the response team provided that the funeral procession was followed by a police vehicle. But as the procession made its way to the cemetery, the driver of the hearse suddenly changed course. The driver headed with the coffin to a family plot in the Butsili district of Beni instead of the official cemetery, where burial could be conducted more safely. The police continued to follow. But once the procession reached the family plot, several young people from a nearby neighborhood violently chased away the police. Before the end of the day, the young people and the family members panicked. They realized it would be a mistake to bury the body in the family plot. So they brought the body back to the official cemetery, and the five family members wearing the personal protective equipment proceeded to bury the deceased as originally planned. The next day, several members of the family voluntarily presented themselves at the hospital to get vaccinated against Ebola. They guaranteed that no one had directly handled the body of the deceased at any point between its release from the Ebola treatment center and burial in the cemetery. They said neither the coffin nor the body bag had been opened. In addition, residents of the Butsili neighborhood where the family lived held an extraordinary meeting on Thursday at a local office. They apologized to the Ebola response team and promised they would not let such a situation happen again.